an idealizing or idolizing biography. It comprises six volumes and is taken almost exclusively from the sermons of William Branham with absolutely no critical thought on the part of the author. Every event in this book happened. Many of these stories are well documented from multiple sources. In my research I made use of newspaper and magazine articles, books, photographs, films, and testimonies by people who knew William Branham personally and were eyewitnesses to some of the supernatural phenomenons (sic) described in this biography. We take exception to the above statement. Why? The author is a dedicated member of the Branhamite sect (which they refer to as The Message). As a result, he completely failed to make a critical examination of the life of his prophet critically. Jorgensen holds William Branham's word as being equivalent to the Bible. As a result, he assumed that everything that William Branham stated about his life was true (even though independent research has proved that William Branham was not even truthful about his date of birth). 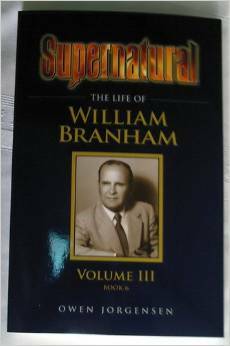 William Branham's books and sermons. There is a reference to an article in the Jeffersonville Evening News entitled "Mysterious Star Appears Over Minister While Baptizing", however, based on the work of research performed by Searching for Vindication, Jorgensen's reference is simply based on a story by William Branham. Jorgensen never attempted to verify whether the newspaper article actually appeared as William Branham stated. (Book Two, Pg. 117). If Jorgensen had examined the newspaper archives, he would have found that the referenced article does not exist, except for a reference to 14 converts. The author states in Book Six, pg. 149 that William Branham "did not borrow from the past, or copy from his contemporaries; he blazed a new trail", thus demonstrating that even in his analytical comments, Jorgensen is out of touch with reality. All one has to do is read our article on plagiarism to determine Jorgensen's complete failure to do any analytical research. Well over a hundred significant issues relating to William Branham and his message have been identified. Yet, Jorgensen does not deal with any of these major issues in his pseudo-biography. General problems and concerns relating to Branham's overall credibility. This page was last edited on 17 January 2016, at 01:27.